Who are we? That's an easy one. We're for animals. Now, that might sound like a "what" rather than a "who," but actually, it's who we are. What aren't we? We aren't radicals. Or nut jobs. Or animal rights whackos. We're not vegans, or even vegetarians. We don't torch research labs that do animal testing. We don't blindly support every animal rights group or agenda that comes along. The bottom line, simply, is that we care. We suffer when animals suffer. We believe animals have every right not to be treated poorly. They're not property. They're not disposable. We believe we have a responsibility to protect them, big and small, and to scream to the world, in no uncertain terms, "Animal cruelty won't be tolerated." It's our goal to spread the word about compassion and the importance of treating animals with mercy and kindness. It's our goal to inspire people to take action for a cause that needs fighting. Join us in this important fight! 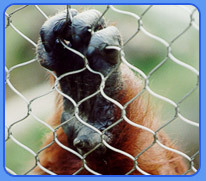 It's time to pull aside the curtain here at AnimalRightsStand.com. Let's find out who's responsible for this little animal sanctuary on the Web. Scott Roeben is the Webmaster, copywriter and jack-of-all-trades here at AnimalRightsStand.com. Scott grew up with animals, but grew to love his brother and sister in time. Scott currently works in online marketing in Las Vegas. He's the creator of the popular humor site, Dribbleglass.com, as well as a popular Las Vegas blog, VitalVegas.com. You would make his day if you purchased one of the T-shirts he created. Naturally, a portion of our proceeds goes to animal rights causes. Baker D is a bottlenose dolphin. He was rescued by the Marine Mammal Center, and we adopted him. Baker D was rehabilitated and released. He's currently residing in the Channel Islands. He has many talents, including being able to perform a number of bar tricks, including breathing through the top of his head. The ladies love that one.